When I posted my other Ulta3 flakey I said that I used to have an orange one which I thought I threw out. Well..... my mum came visiting with an awesome little baggie with some old Ulta3 polishes in it. Included amongst them was Crazy. I think I went a little crazy when I saw it. It was a little thick so I added some Seche Restore and BAM, it's like new again. This is two coats of crazy over two coats of Ulta3 Chocolate cake, then two coats of Seche Vite. Most of the time the flecks are orange, but there is a lot of green highlights amongst them too. Let me say that this polish is a real pain in the bum to apply. I really had to fish out the flakey bits and try to get them positioned on the nail. It's also really hard to get a smooth finish because the little flakey bits don't lay flat. I had to use a tooth pick to press edges down into the polish. I really wish Ulta3 had a dark green creme. I think this flakey would look awesome over green. Unfortunately I don't own any dark green cremes, I think I better work on that! 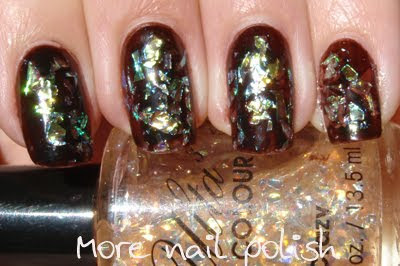 Here are some bottle pictures of the two 'old school' Ulta3 flakey polishes. 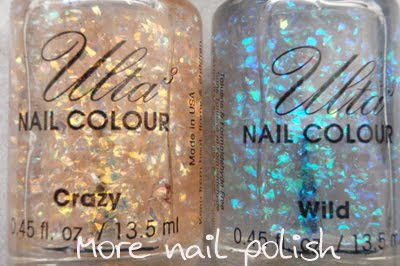 Sorry, I know these aren't available anymore and its mean to share polishes that are discontinued, but I just had to share, cause I live in hope that Ulta3 will make them again. Oh wow that is gorgeous!!! Please, please, please Ulta3 bring them back! It looks like you have sparkling gemstones on your fingers!! I agree that it would look great on green. Thanks for sharing them with us. they sell these exact 2 colours at inglot!! ive got the one on the left! Argh, why did I not know about these??! 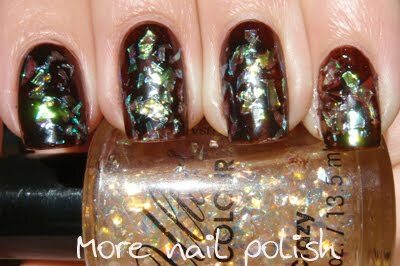 Krissy - I'm going to have to get someone to buy me some Inglot brand polishes. I can't get them here in Canberra. Do you know if you can get them online? I saw the inglot version on Youve got nail at http://youvegotnail.blogspot.com/2010/04/ulta3-sizzling-red.html. I think the Inglot one looks a lot smoother and smaller particles. This ulta3 has really chunky pieces, and has more green highlights. Whoa, I hope they make these again! They look gorgeous.